Note: This article, first published in 2004, formed the basis for my first book, The Cult of Alien Gods. 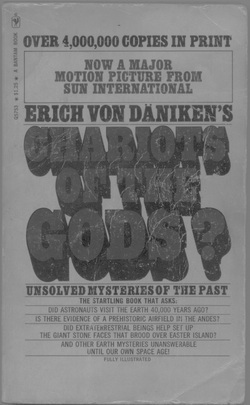 The idea that extraterrestrials served as humanity's earliest deities came to popular attention with Swiss author Erich von Daniken's 1968 best-seller Chariots of the Gods and the influential 1973 NBC documentary In Search of Ancient Astronauts,based on that book. But for people familiar with the science fiction magazines of the 1940s and 50s, von Daniken's "revolutionary" assertion held more than just a hint of other writings that claimed long before that the gods were not of this world. In fact, much of von Daniken's case perfectly parallels the work of a certain New England writer of horror stories, and the route from horror story to nonfiction best-seller bounces us from America to France to Switzerland. Lovecraft's work had also inspired the editors of Planète to write a book, Le Matin des Magiciens (The Morning of the Magicians) a few years earlier, in 1960. The book, by Louis Pauwels and Jacques Bergier, first introduced Lovecraft's concept of alien gods as a nonfiction hypothesis. The authors claimed that their study of religions around the world had led them to higher consciousnesses and to new revelations about the lost worlds of the past. Especially relevant to this is Part One: Vanished Civilizations, where they heap up evidence backing up Lovecraft's fictional claims about alien super-civilizations of the past. Unfortunately now long out of print [Note: The book was reprinted after this article was first published. ], the book Morning of the Magicians laid the foundation for all the lost civilizations books to follow, including Chariots of the Gods. As R.T. Gault comments, "It's all here, from the Piri Reis map to pyramidology. The authors are frankly fascinated by the idea that ancient peoples may have been more advanced in some of their technologies than we generally believe" . "Charioteer of the Gods" first appeared in Skeptic 10.4 (2004). © 2004 Jason Colavito. All rights reserved. Reproduction of this article is strictly forbidden without the express written permission of the author and Skeptic.